Your smoothie is only as good as the ingredients you put in it. If you load it up with sweetened yogurt, juice, and honey you’ll just get hopped up on sugar. Sugar is not very filling. You’ll get a blood sugar spike that will soon send you crashing down in hunger again. 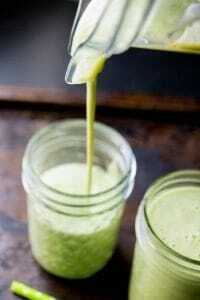 One of the key components of a good smoothie is protein. Protein is hands down the top nutrient for keeping you feeling full for longer. In science-talk that’s called satiety. You don’t want to eat a meal only to feel hungry again an hour later. You want to eat a meal and then be able to forget about food again for several hours! Research shows that a high protein breakfast can have a lasting impact throughout the day… not just the next meal. In fact, in this study, a high protein breakfast reduced EVENING snacking! So how much protein should you aim for? For meals, a good goal is to get 20-30g. For a filling snack, aim for 10-15g. I’m a big fan of smoothies. Not only are they a convenient way to get in that protein, it’s so easy to add in fibre for even more satiety AND veggies for a health boost! I also have a little obsession with my Vitamix blender so I’m always happy to pull it out. 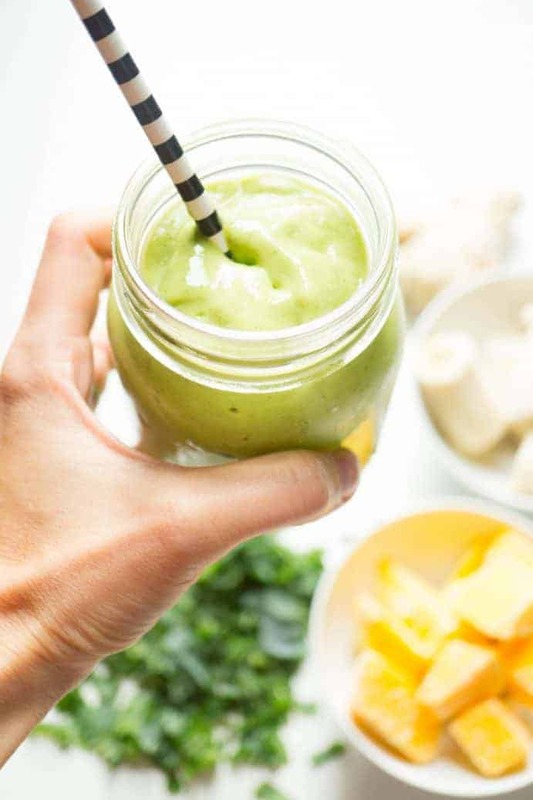 To get even more bang for your smoothie making, keep a jar of this DIY smoothie booster in your cupboard. It will bump up the protein, fibre, and omega 3 fatty acids. 1) This peaches n cream smoothie gets its creaminess from cottage cheese. There’s no cream in sight! It lands the top spot with 21.5g of high quality protein and has a velvety smooth texture. The hemp hearts are optional but add minerals and omega 3 fatty acids. 2) Nearly all the ingredients for this anti-inflammatory turmeric smoothie were carefully selected for their anti-inflammatory properties. There’s also a surprise ingredient that sounds weird but doesn’t taste like anything… it just adds protein and fibre! Can you guess what it is? This one comes in second at 20g of protein. 3) Everyone’s favourite flavour combo: chocolate and peanut butter! 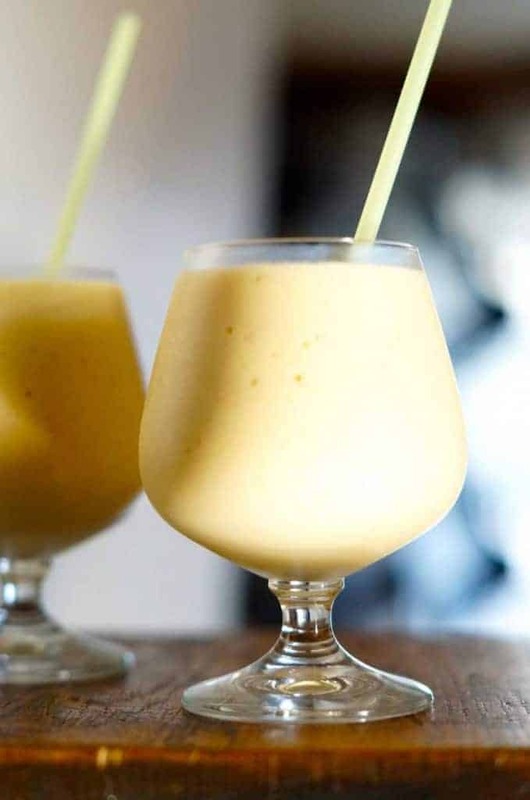 Greek yogurt lends its protein power to this smoothie. Just make sure to choose a yogurt that has at least 14g of protein per 100g. If you do, then you’ll get at least 17g of protein in this smoothie! 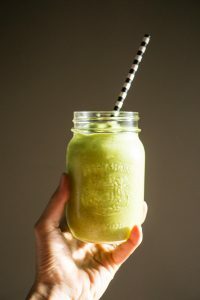 4) You might think I’m really weird for adding romaine and celery to this green lettuce smoothie but trust me: it actually does work! It tastes delicious! 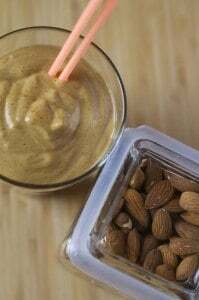 In this recipe both Greek yogurt and almonds lend their protein to bring this one in at 15.5g. Did you know that eating almonds everyday is associated with better heart health? 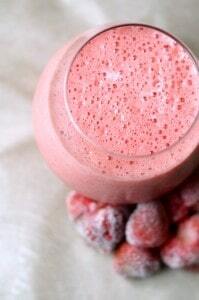 6) This strawberry lime smoothie is perfect for those who need to follow a dairy free diet. Pasteurized egg whites lend their protein power to this recipe. I find egg white based smoothies particularly refreshing in summer. Without any “creamy” ingredients they taste a lot like daiquiris! This recipe comes in at 14.5g of protein. 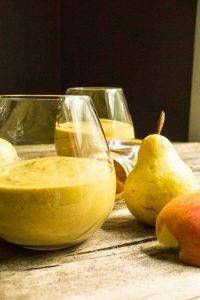 7) I based this recipe for a vanilla pear kale smoothie off of one I had seen on Pinterest dubbed “the world’s best smoothie!” Once I made it, I had to agree! In fact, my whole family had to agree! We make a lot of smoothies around here so that’s really saying a lot! At 11g, it’s not super high in protein but it’s so tasty I had to include it. You can always bump up the protein some more with a scoop of DIY smoothie booster. 8) Who doesn’t love carrot cake? Okay, my husband doesn’t and I’m sure a lot of you don’t either but it’s one of my favourite cakes! 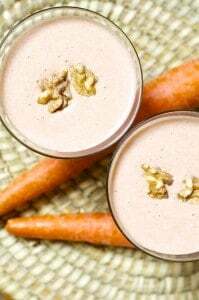 So I always end up making “carrot cake” flavoured recipes like oatmeal, breakfast cookies, muffins, or this carrot cake smoothie. Again, at 10.5g it’s not particularly high in protein but it’d be good for a snack or you could bump up the protein with a scoop of DIY smoothie booster. 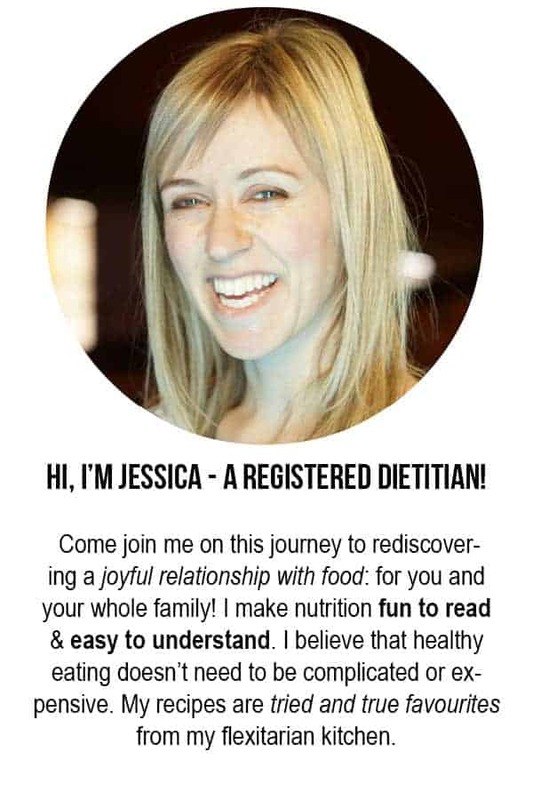 If you’re trying to up your breakfast game, I’ve written a free e-book just for you! It’s called “How to Start Your Day Strong!” Download it here. 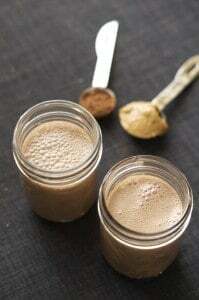 For more protein ideas for your smoothies, check out this post below!